"For the advancement of science and arts"
Auburn University is a university in the U.S. state of Alabama. 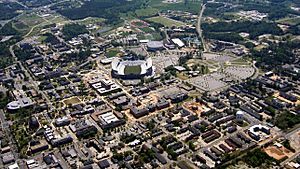 Auburn University is in the city of Auburn, Alabama. People can usually just say Auburn for short when they are talking about the University. 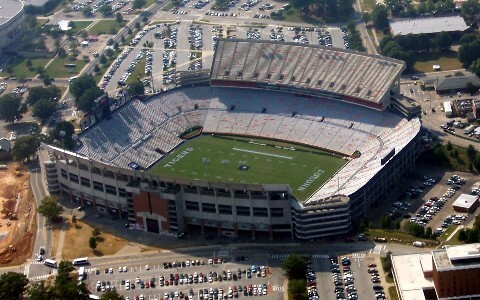 There are about 24,000 students in school at Auburn. Auburn opened February 1, 1856 but was named the East Alabama Male College. The university changed the name many times until 1960 when it was named Auburn University. Auburn is one of three large universities in Alabama. The University of Alabama in Tuscaloosa, Alabama has the same number of students and the University of Alabama at Birmingham in Birmingham, Alabama is the third largest. Auburn University has 12 colleges on campus, including agriculture, architecture, business, education, engineering, forestry, human sciences, liberal arts, nursing, pharmacy, mathematics, and medicine. The Auburn University sports teams are named the Auburn Tigers and the mascot is a tiger named Aubie. 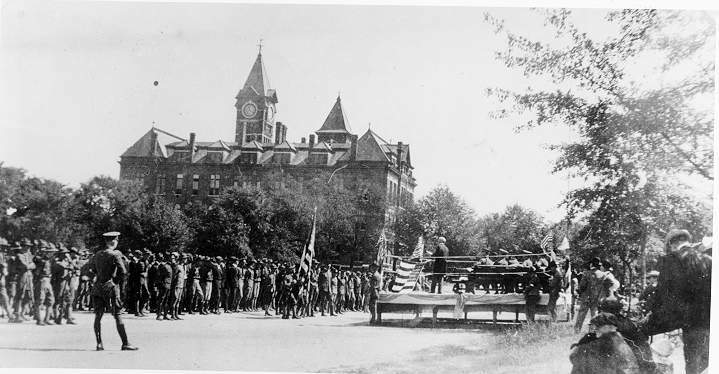 API Cadets drill on Ross Square in 1918. Samford Hall, located on College Street in Auburn, houses the University's administration. Auburn University Facts for Kids. Kiddle Encyclopedia.